It’s been a HUGE month for anti-asbestos legislation, both at the federal level and in California. A few weeks ago, U.S. 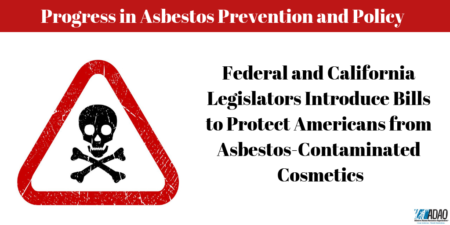 Representatives Debbie Dingell of Michigan and Jan Schakowsky of Illinois introduced legislation that would require warning labels on cosmetics marketed to children that could contain asbestos. This comes on the heels of the U.S. Food and Drug Administration (FDA) discovering asbestos in several makeup products sold at the tween retailers Claire’s and Justice and issuing a press release warning the public of the danger. As a result of the FDA’s findings, Claire’s issued a voluntary recall of the contaminated products, but the FDA pointed out problems with the current regulatory system wherein cosmetics aren’t required to be tested for safety before hitting the shelves. “Right now, when it comes to cosmetics, companies and individuals who market these products in the U.S. hold the responsibility for the safety and labeling of their products,” the FDA’s press release says. The Children’s Product Warning Label Act would require cosmetic products marketed to children to bear a warning label informing consumers that the product has not been evaluated for asbestos contamination unless the manufacturer or retailer can demonstrate to the FDA that the product is asbestos-free and prove to the U.S. Department of Health and Human Services (HHS) that the talc in the product has been sourced from an asbestos-free mine. “Most Americans are shocked to realize that cosmetics and personal care products are one of the least regulated consumer products on the market,” bill co-author Rep. Schakowsky said in the press release. In California, a bill introduced in February by State Assembly Members Al Muratsuchi and Buffy Wicks goes even further. Their bill would actually make it a crime to sell cosmetics contaminated with asbestos, lead, and a number of other toxins. The Toxic-Free Cosmetics Act would also strengthen the state’s regulatory process by requiring the Department of Public Health, which investigates cosmetic products, to refer all violations to the Attorney General so legal action can be taken. While asbestos in makeup and other talc-based grooming and hygiene products represent just one facet of the exposure risk, this is a huge step forward in protecting consumers and ensuring their right to know when products on store shelves pose a deadly risk. Please join me in extending our deepest gratitude to the lawmakers who have seen the realities of the asbestos risk and taken action to protect us. But let’s not stop at gratitude — we must all reach out to our state Representatives and urge them to support the Dingell-Schakowsky Children’s Product Warning Label Act. No one knows better than we do how important this legislation truly is. This is the time to MAKE OUR VOICES HEARD! Together, we are moving toward an asbestos-free world — one step at a time!